2012 Minot Convention & Visitors Bureau Annual Meeting - Word on the street with Visit Minot!Word on the street with Visit Minot! Please join us on March 28th at 12:00 pm at the Holiday Inn Riverside for the 2012 Minot Convention & Visitors Bureau Annual Meeting “Recover the Magic”. Our featured speaker will be Dan Rowe, president and CEO of the Panama City Beach Convention & Visitors Bureau. Rowe led Panama City Beach’s tourism efforts through the Gulf Coast Oil Spill. He quickly became the media spokesperson for the region, countering travelers’ concerns about the impact on the area’s beaches. He also drove the community to partner together on several initiatives including vacation guarantee programs, gift card incentives and a Summer of Fun calendar of special events. Rowe’s quick thinking and publicity on national news outlets such as CNN, Fox Business, MSNBC, The Weather Channel and NPR attracted the attention of the Obama administration which resulted in a visit by the First Lady followed by a summer vacation in Panama City Beach for the First Family. Rowe’s steadfast work during the crisis paid off. While Panama City Beach makes up 28 percent of the Northwest Florida tourism market, the destination only experienced 17.6 percent of the loss. Additionally, revenues during the summer period were down only 15 percent compared to nearby destinations which suffered a 30+ percent decline. The cost to attend is $10 per person and lunch is included. 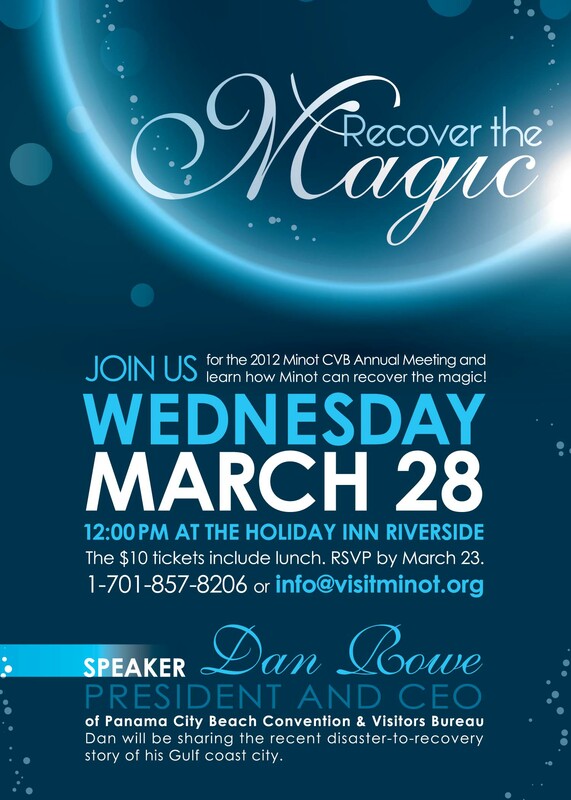 Please RSVP by Friday, March 23rd, by calling the CVB at 857-8206 or info@visitminot.org.